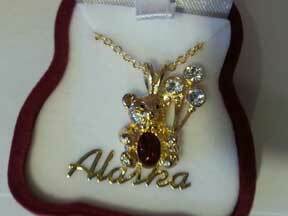 Birthstone pendant in Teddy Bear shaped box. Box matches color of birthstone. Pendant is teddy bear with birthstone in tummy. Bear is holding "diamond" balloons. Pendant is approx. 3/4 inch, total length and includes 16" gold chain. A perfect gift for your favority Teddy Bear fan. Only 5 bears available in total. Regular Price: $13.99 each, now $4.99 each. When ordering, please send a quick email to our Customer Service department (customerservice@alaskagiftcenter.com) and let us know which month(s) you want.